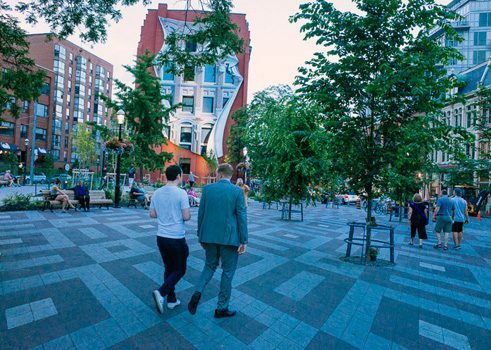 Wedged between two converging streets and tucked away behind the Gooderham Building, Toronto’s famous flatiron building, is the small, almost triangular Berczy Park. This little neighbourhood green space is named after William Berczy, one of the founders of Toronto. Berczy was born Johann Albrecht Ulrich Moll in Bavaria, located in current-day southern Germany, in 1744. He grew up in Vienna and spent time in Italy and England, where he worked as a painter. While in England, he heard about the opportunity to settle and develop land in America. After recruiting peasants from northern Germany to assist in colonisation, Berczy moved with his colonists to Pennsylvania in 1792. Unfortunately, upon arrival, the land owners refused to provide Berczy and his settlers with the land and supplies they were promised, so they decided to try again in Upper Canada. John Graves Simcoe, often credited as the founder of Toronto, was Lieutenant Governor of Upper Canada at the time. He felt the then-capital of Upper Canada, Niagara-on-the-Lake, was too close to the US-Canadian border considering possible hostility between the United States and Britain. Simcoe temporarily moved the capital to the north shore of Lake Ontario to a site he named ‘York’. This would eventually become Toronto, but was undeveloped wilderness when selected for its strategic location. In 1794, Simcoe offered Berczy and his colonists a large land grant north of Toronto in what is now Markham. In exchange, they would do the work to establish the new town of York. As part of their agreement, Berczy and his group were given a year to build Yonge Street from the York area north to Lake Simcoe. In addition to clearing a large stretch of Yonge, the settlers built several of Toronto’s earliest houses, mills, and stores, as well as a bridge across the Don River. However, because of the number of projects and a shortage of supplies, they were unable to complete the agreed length of Yonge Street within the year. Simcoe demanded that the land in Markham be returned to the government because of their failure to finish the job on time. After arguing his case to no avail, Berczy ended up moving to Montreal, where he restarted his painting career. He lost a lot of money in his colonisation efforts, so the last years of his life were difficult, but artistically he flourished. His portrait of the Mohawk leader Joseph Brant (c. 1807) hangs today in the National Gallery of Canada. In fact, he is often remembered more for his work in the arts than for his role in Toronto’s settlement. Berczy Park ensures his contributions to early Toronto are not forgotten.